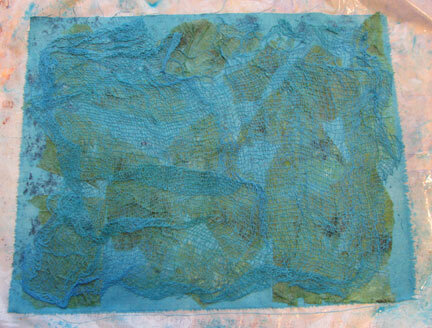 I love to collect the paint-soaked paper towels that I use during my fabric painting sessions. Since our motto around here is "Don't throw anything out", I've been using these clean-up towels to make cards and as backgrounds for other projects for quite some time. 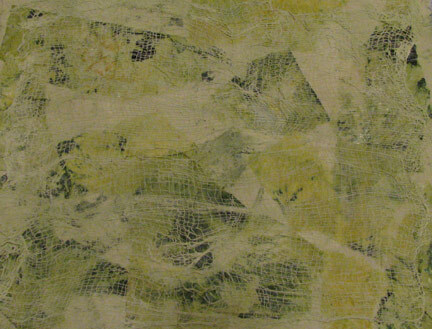 I also like to layer them with fabrics to create some unique surfaces for use in my quilts. 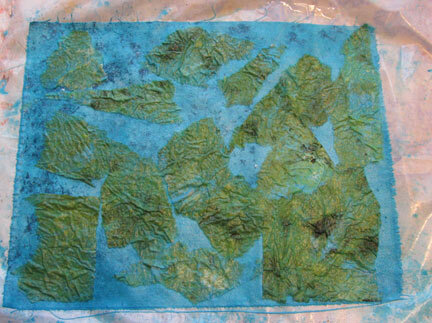 Beryl Taylor teaches a method of layering fabric and paper that I read about in her book Mixed Media Explorations. 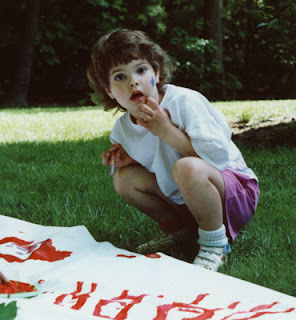 She uses glue instead of gesso and tissue paper instead of cheesecloth. Because of the glue, her fabrics are more durable and stable that mine, but they can also be more difficult to stitch through. If you use my method, handle your completed fabric pieces with care until you've had a chance to stitch them together for more stability. 1. 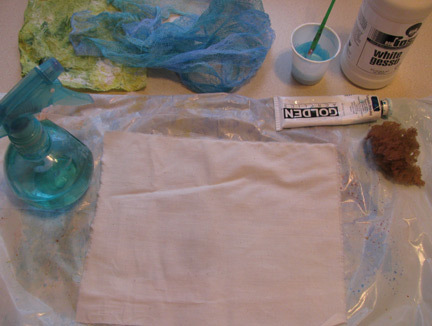 Cut muslin to size and spray with water. 2. Sponge with tinted white gesso. 3. 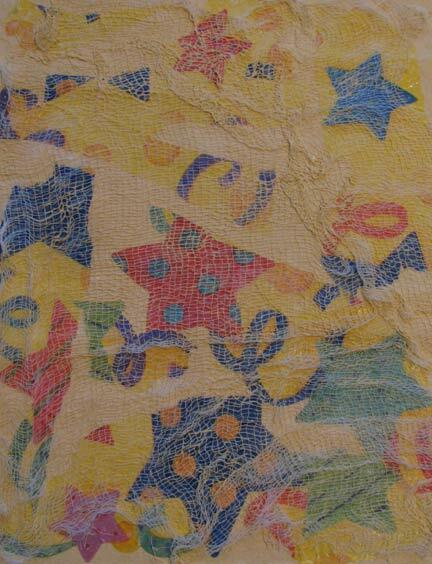 Layer with painted paper towel pieces or other papers. Spray with more water. 4. 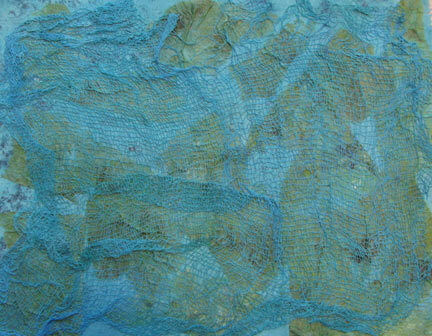 Layer with distressed cheesecloth (plain or painted). 5. 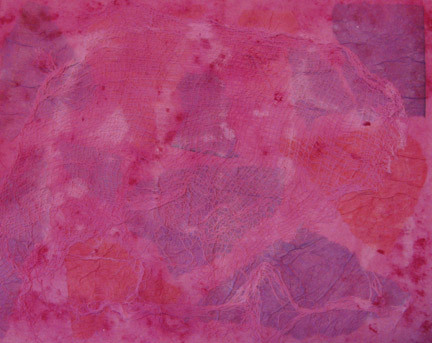 Dab with more tinted gesso, spray with water, and blot with paper towel. 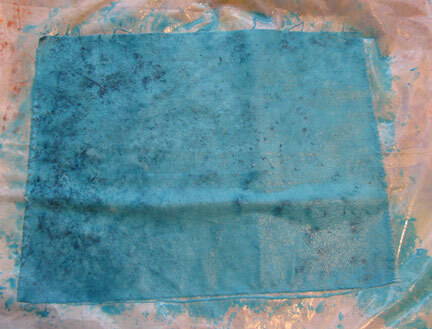 This is what the fabrics look like dried and ironed. Use parchment paper! The distressed cheesecloth really completes the look. I love this! You are one talented lady! !